This jumbled house in India features an elevated steel tunnel, bridged corridors and a rooftop swimming pool on stilts. 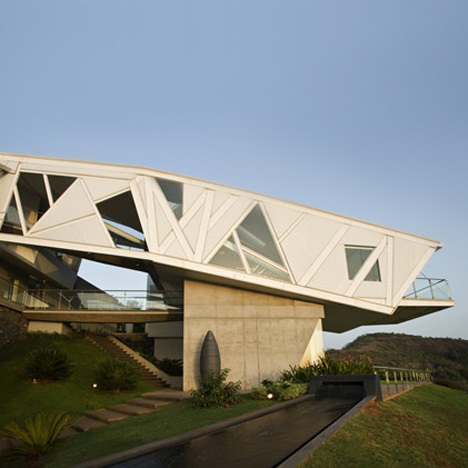 Designed by Indian studio Malik Architecture, House at Alibag is located on a hilltop facing the Mumbai skyline. Faceted walls and ceilings line rooms throughout the house and are perforated by both rectangular and triangular windows. At the centre of the three-storey building is an open courtyard, over-sailed by bridges connecting rooms on the first and second floors. The angled tunnel that drives through the upper storeys of the house encloses a bedroom at each end, joined by another of these bridges. The rooftop swimming pool shelters an external terrace at the rear of the house. This is the second project by Malik Architecture on Dezeen in the last few days - see our earlier story here about a cantilevering office block next to a slum. See also: more stories about projects in India. Photography is by Bharath Ramamrutham. The site for this home is a hill in Alibag, one which enjoys a stunning view, not only of the rolling contours surrounding it, but of the sea and the skyline of Mumbai in the distance. Conceptually, the design of the home is a departure from the “stepped terrace” typology that one would conventionally employ on a heavily contoured site. Instead, we chose to deconstruct a cuboid that is tilted and suspended over the ground and seems to simultaneously ‘float’ and ‘flow’ down the hill.The contours of the hill have been used to organize the structure over 3 levels. The ‘tube’ contains 2 large bedroom suites at different levels with a large interstitial void that is inhabited by floating connections.The creation of singular sensory experiences has been the primary organizing and sculpting vector. Numerous geometric inflections and articulations are designed to engage the senses in unconventional ways. A walk through the house is meant to yield unique moments of being suspended in space, of intimate enclosure, of vertiginous assaults but most importantly, of being connected to nature. The structure follows the design philosophy with concrete planes making contact with the ground, while steel floats above it. The home seems to conduct a constant dialogue with the ground on which it rests; it is informed by the earth but chooses at certain junctures to thrust over a precipice, completely oblivious of it. A second home on the same site as house no. 1 was commissioned only weeks after construction began on the first house. We were now faced with the conundrum of creating a complementary foil to the distinctly extroverted structure that was perched on the apex of the hill. On the one hand we felt that the second home ought to partake of the same stunning views that presented themselves to the first house, but any significant built up mass would not only compete with but also vitiate the geometric singularity of the first home. The solution presented self in the form of an existing degraded concrete structure that was intended to be a home for the land’s previous owner. By locating the second home on this footprint and by making use of the already excavated area, we were able to submerge the house beneath the ground. The only trace of development, when viewed from the first home, was a crystalline fragment emerging from the earth. The home is self effacing, a more discrete and introverted alter-ego of its hilltop sibling. The main roof of the living room and verandah is a re-interpretation of the traditional clay tiled roof, but re-designed for better performance. It has been parametrically manipulated to dip and extend to provide weather protection for the main pool deck, the entrance verandah and the car porch. In addition it sweeps upwards to allow headroom for the stair leading to the upper level.High wind speeds and heavy rains necessitated re-analysis of the traditional pitched roof which while performing well in homogenous spatial conditions, failed to meet the multiple performance criteria we required. Part of the client’s brief was the desire to have the primary living space (living room) and verandah in close proximity to the swimming pool. We used the contours of the hill to design a stilted pool that satisfied the client’s requirements and also provided an auxiliary shaded verandah below it opened onto a large garden and which could be used in inclement weather.The knife edge was created to merge the pool foreground with the background of the Arabian Sea. The ‘Tube’ that rests on the two blocks is tilted at an angle that is almost identical to the natural slope of the ground and with a single gesture, a tangible link to the hill is created, whilst simultaneously generating a physically liberated space. The earth is forced into the centre of the home, whose vertical proportions complement the intrinsic horizontality of the geometry. Similar programs are linked by the volume and its skins provide weather protection to the bridge connections hovering within the courtyard. The concept of the floating tube allowed for the elevated perch which was desired to give the occupant the best possible view of the surroundings without creating large obtrusive footprints on the ground.The house functions as a tool to interpret the landscape. At numerous junctures, the object dematerializes to create a sense of floating amongst the elements, and its unique strength is the varying experiential conditions it creates at different points in space and time. Built-up area: 11500 sq. ft.